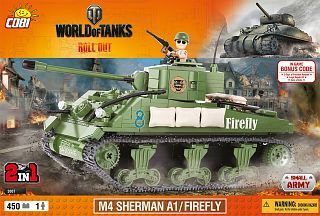 The M4 SHERMAN A1 – first version of Sherman in production, best known American tank from World War II. 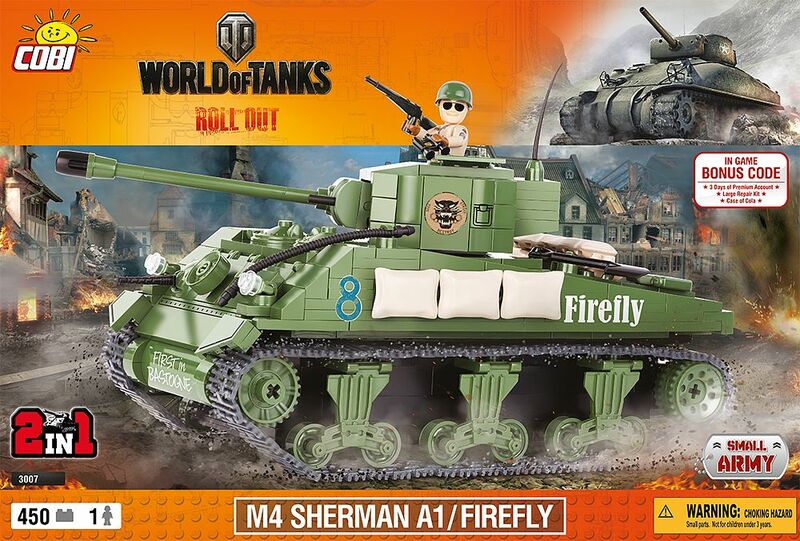 SHERMAN FIREFLY – modified version of American tank M4 Sherman made by the British during World War II. This version has a much larger cannon at 17 pounds. From 1944 there were between 2,100 and 2,300 such vehicles made. In the game ‘World of Tanks’ the Sherman has the most powerful of cannon among the tanks on the sixth level. 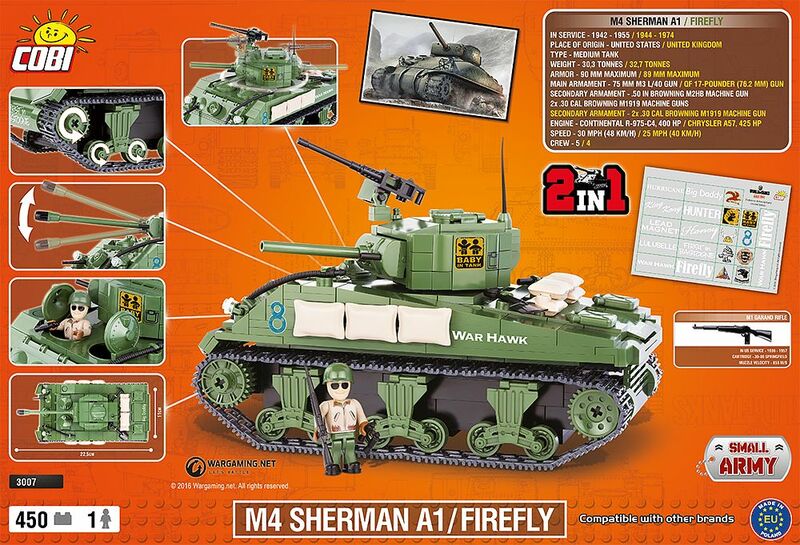 With this 2 in 1 block set you can build a M4 Sherman A1 tank with turret or the Sherman Firefly with a larger cannon. The model has rotating turret with adjustable cannon, three operable trap doors and a machine gun installed. Binoculars and additional gun for the mini figure are added to the set. 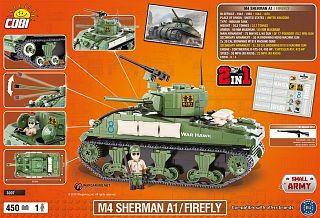 M4 SHERMAN A1 – die erste Produktionsvariante von Sherman, dem bekanntesten amerikanischen Panzer aus dem 2. Weltkrieg. SHERMAN FIREFLY – modifiziertes Modell des Panzers M4 Sherman, die von den Britten während des 2. Weltkriegs entwickelt wurde. Von seinem Prototyp unterschied er sich vor allem durch die viel größere 17 Pfund Kanone. Seit 1944 wurden zwischen 2100 und 2300 Fahrzeuge hergestellt. Im Spiel The World of Tanks verfügt Sherman über den höchsten Grad der Kanonenpenetration unter den Panzern des sechsten Levels. Bausteinset 2 in1- man kann daraus einen Panzer mit Turm M4 Sherman A1 oder Sherman Firefly mit der größeren Kanonen bauen, was mehr Spielmöglichkeiten bietet. Das Modell verfügt über einen drehbaren Turm mit beweglicher Kanone, drei aufmachbare Luken und eingebautes Maschinengewehr. Das Set enthält außerdem ein Fernglas und eine zusätzliche Waffe für die Minifigur. When will this be back available in the shop? If in the future there will be a "Fury" sticker in the sticker sheet that could be applied on the barrel a little reference of Fury 2014 the movie. We are sorry to hear that so many parts are missing in your set. Such things do not usually happen with our products. We suggest you contact us at office@cobi.pl and describe your problem. We'll try to help. I forgot to fullfil info. Sherman n.3007 with missing articles inside bag n.1 was series n.1/2016 ! Date of package , signed on box by stamp from inside, 2016-06-09. We do our best to provide as good customer service as possible. We appreciate all opinions and comments so that we can keep improving. We are glad to hear we could help you.